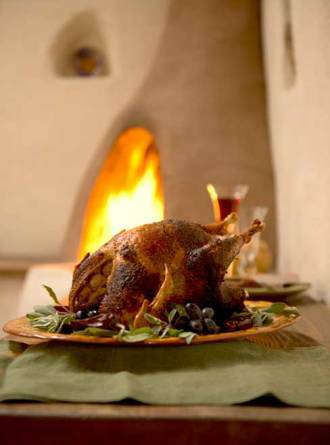 Celebrate with a heritage turkey raised naturally in New Mexico. This Thanksgiving Day I plan to give thanks to New Mexico farmers like Pollo Real’s Tom Delehanty and Tracey Hamilton, who are rescuing venerable turkey breeds such as Spanish Black and Standard Bronze from the verge of extinction. In 1997, heritage turkeys were identified by the American Livestock Breeds Conservancy as the most “critically endangered of all domestic animals.” It may sound counterintuitive, but the best way to help save these breeds is by putting them back on our dinner tables, especially at Thanksgiving. Increasing the demand for the turkeys makes it more profitable for farmers to continue raising them. Of course, choosing a heritage turkey isn’t just an exercise in altruism. Its deeper flavor and savor should make it the stuff of future family culinary legends, especially if you roast it in one of the ways suggested here.